It’s a holiday season classic. Eggnog is a rich a decadent drink that is often served at festive get-togethers. 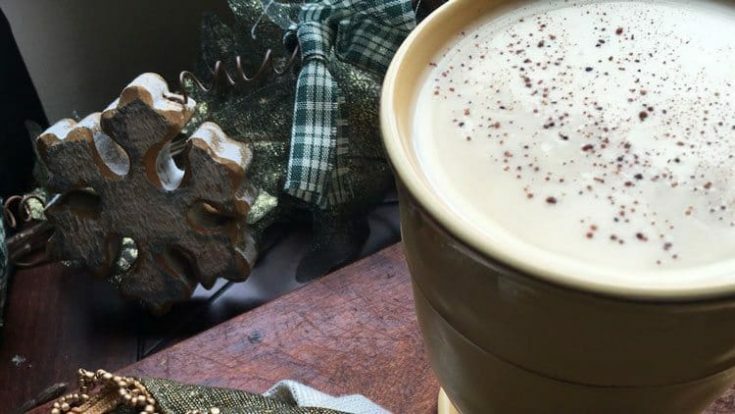 If you love egg nog, you’ll adore this recipe. Skip the store-bought egg nog carton and make your own. Not only is it a richer alternative, but the freshness you get from a homemade recipe is top notch. Serve this eggnog recipe alongside some of your favorite cookie recipes. We like to serve it with our Chocolate Chocolate-Chip Cookies, Snickerdoodles, and even tasty No Bake Chocolate Drop Cookies. This eggnog recipe is so easy to make that it is the perfect drink to serve when you have a holiday party. Whip up a big batch and serve it up all around. This drink is great for kids and adults alike. When you’re preparing it, you’ll need a candy thermometer to make sure that the eggnog mixture is heated to the correct temperature. If you’d like to make a grown-up version, feel free to add a splash of alcohol to the drink. Egg nog is served cold and is steeped in tradition. Add a dash of cinnamonand it’ll not only be a flavorful drink, but it’ll be a perfect pairing with holiday cookies and treats. If you want to get all fancy, it’s fun to tie some decorative ribbon around eggnog mugs. In a separate glass bowl, stir evaporated milk and half and half until combined. Heat egg mixture over medium-low heat while stirring constantly to prevent the milk from scorching. When mixture reaches 160 degrees on a candy thermometer, remove from heat and slowly whisk in evaporated milk mixture. Cool slightly before tasting. Add more sugar or nutmeg, if desired, before transferring to an airtight container. Refrigerate overnight or until thoroughly chilled. Serve in mugs and garnish with whipped cream, cinnamon sticks, or a dash of nutmeg.